Jiu-Jitsu, which means gentle art is the oldest form of martial art. It originated in India more than 2000 years before Christ. It was created by monks who could not use any type of weapons to defend their lives against barbarian attacks. It spread through China, and eventually took root and was elaborated on in Japan becoming the first martial art style. In 1914 a Japanese Judo and jiu-jitsu master named Mitsuo Maeda (called Count Koma, meaning Count of Combat) came to Brazil. In return for help from the Brazilian politician Gastao Gracie, Koma volunteered to teach Jiu-Jitsu to Gastao's son Carlos. Carlos in turn taught his brothers (most notably Helio). They went on to further refine the art via constant no-rules competition, developing what is now known as Gracie Jiu-Jitsu. Helio Gracie the lighter in weight brother (only 135 pounds) introduced the application of leverage to the art, making it possible for a smaller opponent to defeat a larger one. The Gracie style was created in Brazil in the early part of this century by Brazilian Jiu-Jitsu pioneer Carlos Gracie, who studied traditional Japanese jiu-jitsu as a teenager under the great Japanese champion, Mitsuyo Maeda (known in Brazil as Conde Koma -- the "Count of Combat"). 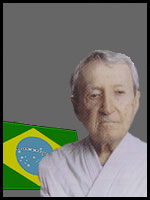 Carlos Gracie, who was interested in streetfighting and was also a boxer, quickly modified the classical techniques he learned from Count Koma to meet the demands of real, "no rules" fighting in the streets of Brazil. The young Carlos Gracie then tested and refined his system through constant matches, open to all comers, constantly working to make it more effective. At one point, he even advertised in newspapers and on street corners for new opponents upon whom to practice and further refine his art. He fought anyone and everyone who was willing, regardless of size, weight or fighting style. Even though he was a mere 135 pounds, his style was so effective that Carlos Gracie was never defeated and became a legend in Brazil. This tradition of open challenge is a part of the heritage of the Gracie style of jiu-jitsu. Carlos Gracie taught his style of jiu-jitsu to his four younger brothers (Oswaldo, Gastão, Jorge, and finally Helio) and to his older sons (including Carlson and Carley), and they in turn taught their brothers, sons, nephews and cousins. After Carlos retired from the ring, he managed the fight careers of his brothers and sons, continuing to challenge fighters of all styles throughout the world. This tradition of open challenge has been continued by his sons, grandsons, brothers, nephews, and students, who have consistently demonstrated the superiority of the Gracie style in real fights and minimum-rule matches in rings throughout the world. Carlos Gracie had 21 children and his youngest brother Helio had 7 sons, creating a virtual dynasty of Gracie fighters and instructors who dominate the world of "no rules" fight contests today. In these events, Gracie representatives have consistently demonstrated, in open competition against title holders from other martial arts styles, that the Gracie style of Jiu-Jitsu is the most effective fighting art in the world today. 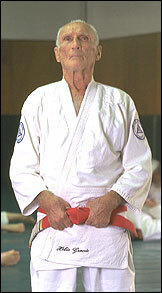 No small wonder that the Gracie style of Jiu-Jitsu is the "hottest" item in martial arts today. Helio Gracie at the age of 17 first stepped into the ring in Frontao against a boxer named Antonio Portugal where Helio won in 30 seconds. Some of his astonishing feats include the longest fight in history: three hours and forty-five minutes, non-stop with his oldest student, Valdemar Santana; and he was the first jiu-jitsu master in the western world to practically defeat a Japanese jiu-jitsu master: Namiki in 1932. This was the first jiu-jitsu battle of his career and also the first time he wore a gi during a combat fight. Helio ended the fight with Namiki in his guard when the bell rang a few seconds before Namiki tapped out. Another amazing performance of Helio was his brilliant fight against Kato, World Jiu Jitsu vice-champion, at Maracana Stadium which seats 120,000 people. The fight ended in a draw and Helio asked for a rematch. The second match, held in Ibirapuera Stadium in Sao Paulo, was a very technical fight. Helio defeated Kato with a choke hold. His victory brought glory to Brazil and international recognition to Helio's art in the Jiu-Jitsu world. Upon defeating Kato, a challenge match was set between Helio and the world Japanese champion, Masahiko Kimura, probably the best fighter that Japan has ever produced. This historical match took place in 1951 and was held in the Maracana Stadium. At this time, Helio was 42 years old and weighed 63kg, and his opponent Kimura was 34 years old and weighed 100kg. The 37kg lighter Helio lost after his brother Carlos threw in the towel. Helio also challenged boxing greats Primo Carnera and Ezzard Charles, and world champions Joe Louis and later Muhammad Ali, to matches to compare styles. They all declined. An example of courage and determination, Helio became a national hero in Brazil. After a lifetime of combat, he still teaches the art and has the same determination to live jiu-jitsu as his lifestyle. He is recognized as the creator of the style. Helio, the youngest, stood out the most, despite his 62kgs(140lbs) he defeated countless opponents much heavier (sometimes double his weight), of different fighting styles like Capoeira, Greek-Roman Wrestling, Boxing, Judo, Karate etc... Helio adapted the Jiu-Jitsu techniques making it easier for weaker people to fight against stonger people, creating the Gracie Jiu-Jitsu style and being considered the father of Brazilian Jiu-Jitsu.